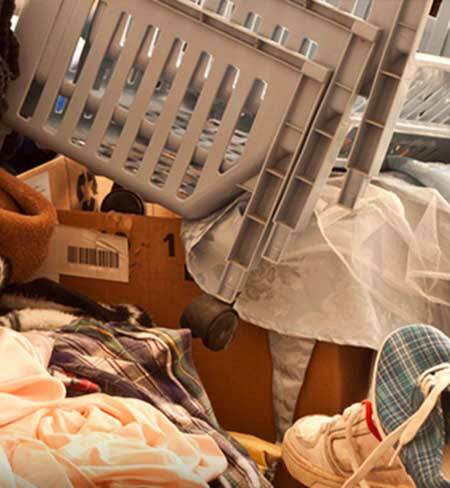 Hoarding can be a sensitive topic and serious situation to work through, but our team is trained by the number one hoarding expert in America, Matt Paxton from TV series, “Hoarders.” We use insight and techniques shared by experts to help a hoarder gain back their space and, in turn, their lives. "I wrote a personal thank-you to the team. My house is on the market and they had it completely restored in 72 hours. It looks like it never happened!" A hoarding clean up is more about compassion than cleaning. After eye-opening training classes with Matt Paxton in 2014 and years of practice, our team is highly certified and trained for ‘hoarding and estate cleanups’. Our crew has knowledge and skills backed by the most experienced hoarding expert in America. Our crews are accustomed to cleaning up big messes of all kinds. Our expertise about hoarding, and how to help a hoarder, are reaching new levels of understanding. Each hoarding or estate cleaning is handled differently. Sometimes we clear pathways to make the homeowner safer, or just a room, and sometimes the whole house is sorted through and cleaned. There’s a very wide range of services based on your needs. An estimated 15 million people in America suffering from this disorder. Why are so many people hoarding these days? Hoarding is not a new behavior, it's a new diagnosis. More people are becoming aware of this issue, and therefore, we have more documented issues of hoarding than ever before. But that doesn’t mean hoarding is a necessarily a new behavior. An estimated 1 in 20 people in America are hoarders. We have compassion and understanding when handling a hoarding or estate cleanup situation. Very often, addressing and fixing the issue takes time. We know it takes time, and we’re here to help when you’re ready. We have consistent steps from start to finish. We know communication is critical when addressing hoarding situations. Why is communication critical when cleaning a hoarded home? - We show respect and compassion. - We take time to build trust. - We ask permission before doing any thing. - We listen to the hoarder’s needs. - We treat the person as if he or she were a member of the family. Our team takes pride in serving people who hoard and demonstrating true compassion in difficult situations. We are dedicated to making a difference in peoples’ lives and helping them get their home back. We realize people battling with a hoarding disorder may feel lost, judged, or afraid. In some cases, they may not even be aware there is a problem. Here at ServiceMaster of Kalamazoo, our professionals compassionately interact with hoarders without judgment, with a goal set to earn their trust over the course of the project. Are you ready to overcome hoarding or get help with an estate cleaning? Or maybe you’re thinking, “Someone in my family hoards. What should I do?” Either way, you’ve come to the right place. ServiceMaster of Kalamazoo wants to help you or your loved one gain control of living space and life again. Write to Us. It’s Always a Free Consultation. Visit Kalamazoo Hoarding Task Force for more information on hoarding and receiving hoarding help in the Kalamazoo County area. Are you a little unsure where to begin? We believe giving accurate, free quotes is the right thing to do. Unfortunately, we don’t add our pricing online. Each job is unique and could range hundreds of dollars. Our project manager comes to your facility at your convienience to measure and analyze. We take accurate measurements so we can give accurate quotes. Feel free to call us at (269) 344-3600.